There are a number of books that I return to again and again for ideas and inspiration. Dutch Total Football is one of those books. The author, Terry Michler, has studied the Dutch methodology over many years. This book is a in-depth review of all aspects of their system. 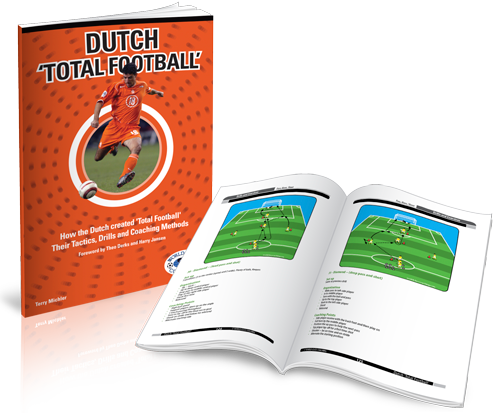 It includes a history of Dutch soccer beginning with the, ‘Clockwork Orange’ teams of the 1970’s and discusses Dutch traits, the role of street soccer and the Ajax Youth Development system. 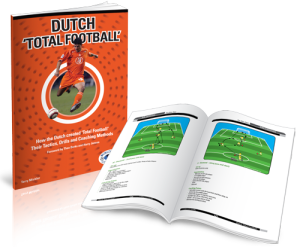 The part of the book I refer to the most are the chapters of practical drills, exercises and small-sided games that the Dutch use to train their players to be technically skillful and tactically aware. Here are a few exercises ‘Y’ Drills that are commonly used in Dutch training sessions. Same as the previous drill with same rotation. Starts the same as the previous drill. The change comes with a 1-2 at the top corner with the middle and corner player. The drill finishes as before, with a controlled dribble and a pass. These are just a handful of exercises from more than 120 diagrams and descriptions that are included in the book. I’m always able to go to this book for great ideas to inspire me to keep my training sessions fresh.